Definition: these past few weeks have been crazy hectic with getting pricing for a much needed interior face-lift on our home. If someone would have told me that we would live in the same home for 20 years 20 years ago, I would have laughed out loud at them. Wow...does time fly by quickly. Okay, I made the most incredible, tender, mouth watering braised corn beef last Friday. The recipe I used originated off of Allrecipes. 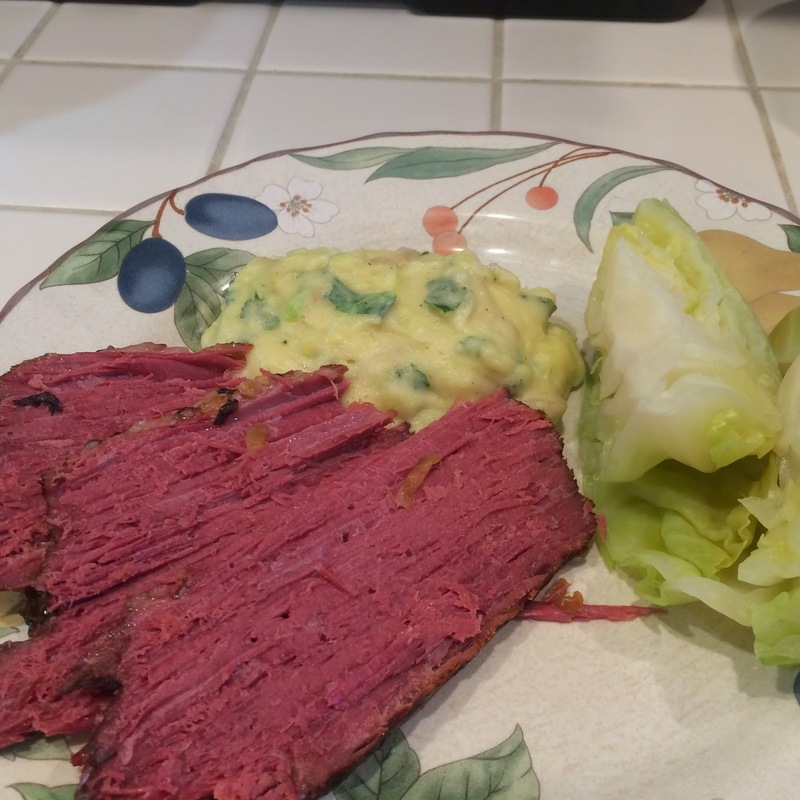 I made some changes based on what others had commented on and it really is an incredibly wonderful way to make corned beef. Before we go over the recipe, I want to tell you that yesterday I was shopping at New Seasons (I adore this place), and they had samples of corned beef made in a crock pot. The first thing I noticed is that it looked different, but I went ahead and sampled it anyway. It was definitely on the dry side, which surprised me given it was made in a crock pot, and not nearly as tender and yummy tasting as the one I made. Based on the sample I tasted, I would never make corned beef any other way than the way described below. If your brisket came with a seasoning packet, discard it. You don't want to use it. Brush browning sauce on brisket. Heat oil in large skillet on medium heat and sear brisket for 5 minutes on the top and 5 minutes on the bottom side. (NOTE: this is the only part of the process that I disliked because the oil wants to go everywhere when you put in the brisket so I recommend putting the heat on medium instead of the medium-high heat I used for a faster cleanup of the stove top or cover the skillet with foil to reduce the mess and keep it on a higher heat. Place 2 very long pieces of Reynolds Wrap inside of your roasting pan in two directions (think of a four way stop or cross shape). Place brisket on a rack on top of the heavy duty aluminum foil that you just placed in your roasting pan. Place your sliced onions and garlic on top of brisket. Fold up Reynolds Wrap around brisket and once you have all of the areas surrounding brisket contained by the foil, pour in your water making sure it stays inside of the foil with the brisket and doesn't leak out. Close the top of the foil and just for good measure put another piece of foil on top of roasting pan enclosing everything and making sure it is secured well. Roast in oven for 6 hours. Do not under any circumstances peek or unwrap brisket to check on it! If you do, you will stop the process and the meat will be dry. This method cooks the brisket by steaming it and you loose the steam if you peek. Just trust the 'force' and it will be fine! Make sure to wrap the brisket very well in foil. Again, you need that steam inside to stay inside. Allow the brisket to cool a bit before slicing and slice in the direction that the brisket wants to be sliced. You will know this because it will not want to slice in any other direction that in the same direction as the grain. Try your best to save some for leftovers the next day. We managed to have leftovers and had corned beef hash and it was fantastic. I served it with steam cabbage and Colcannon made with Kale.